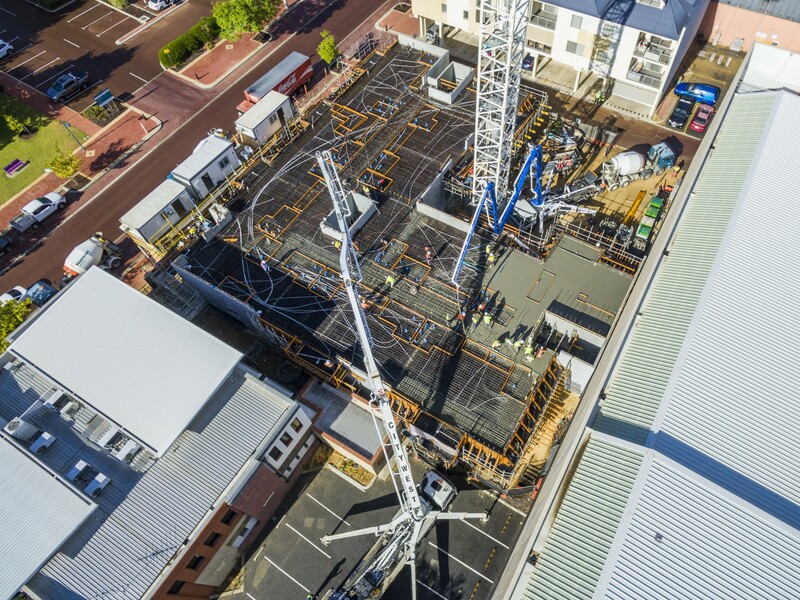 M/Construction took delivery of more than 60 concrete trucks providing over 400m3 of material to dual pumping units for a rapid install of the first floor of Quest Apartments in Joondalup. M/Construction took delivery of more than 60 concrete trucks providing over 400m3 of material to dual pumping units for a rapid install of the first floor of Quest Apartments in Joondalup. Also seen in this aerial and timelapse video is the reinforcement to the deep beams, service conduits for lighting and hydraulic services, timber set downs put in place for the future kitchen and bathroom locations and other works in preparation for the next stage pre-cast panel wall install.